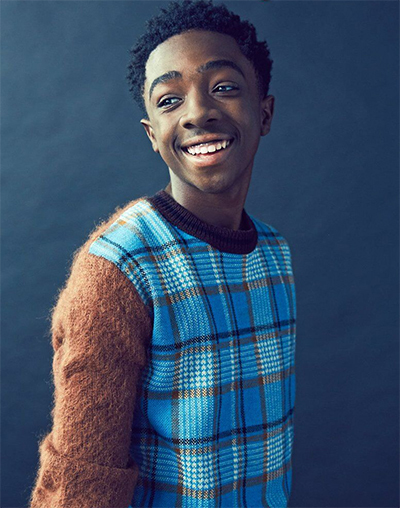 Caleb McLaughlin is a multi-talented, actor, singer and dancer- trained in ballet, tap and jazz. Caleb made his Broadway debut as Young Simba in the Lion King on Broadway, 2012-2014. He performed in the Off-Broadway show, Painted Rocks at Revolver Creek, written and Directed by Athol Fugard, where he received incredible reviews and praise for his role as Bokkie. In the Spring of 2016 Caleb performed as Alex in the Kurt Weil opera, Lost in the Stars with the Washington National Opera at Kennedy Center, Washington, DC. McLaughlin starred in the musical production Jazzland at Lincoln Center with the Wynton Marsalis orchestra, performed with Broadway’s Next Generation at 54 Below, and recorded an album entitled, Broadway’s Next Generation (can be found on iTunes). Caleb has worked on several voice overs and commercials. Television show appearances include: ABC Forever, CBS Unforgettable, NBC Law & Order SVU, HBO miniseries Show Me a Hero, ABC 20/20 What Would You Do?, HBO’s Last Week Tonight with John Oliver, and most recently CBS Blue Bloods starring Tom Selleck. McLaughlin is currently starring as Lucas Sinclair on the Netflix Original Series, Stranger Things alongside Winona Ryder, David Harbor, and Matthew Modine. He can be seen as Jay-Jay on NBC’s Shades of Blue starring Jennifer Lopez. In 2017, McLaughlin will star as Young Ricky Bell in the BET biopic mini-series on the musical group New Edition. Caleb is a well- balanced kid and a true humanitarian. He loves God, his family and appreciates all those who support him on this journey. He will be appearing Saturday and Sunday only.